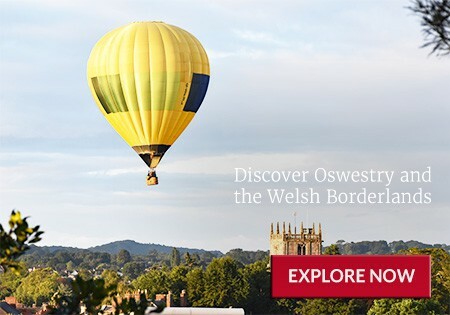 To sign up to the Oswestry & The Welsh Borders Newsletter, simply click the Request Newsletter button below and you will receive news, what's on and special offers. View the Visit Oswestry & The Welsh Borders Online Brochure Now! Are you looking for somewhere different for your 2019 short break or holiday? Have you ever been to Oswestry – where Shropshire meets Wales? Do you like surprises? Then sign up for the Newsletter today and let us tell you more about this quiet corner of England on the border of north west Shropshire and Wales. Oswestry, the small border town on the edge of Shropshire and the brink of Wales may not be familiar to you and certainly, many of the visitors that arrive here say: What a surprise Oswestry is – there is so much to see and explore. We’ll have to come back again. So let us surprise you and tempt you to visit. Firstly, take a spectacular, dramatic and mysterious 3000-year-old hill fort that was the beginning of Oswestry and add a thriving town that still has a weekly market. There’s a lively café culture which, combined with the eclectic mix of small independent shops, entices visitors from miles around. Scatter a few castles around (Chirk, Whittington and Powis); sprinkle in canals, meres, mosses and the World Heritage site of Pontcysyllte Aqueduct and Canal then you will begin to get that distinctive border feeling. Don’t miss the home of The Spoon Gorilla and The Knife Angel, The British ironworks – a more surprising heavy metal day out you will find hard to beat. For a softer animal experience, Park Hall Countryside Experience lets you pamper and feed the local lambs and goats and offers a day of fun-filled farm experience. Choo, choo – don’t miss the railway heritage that rolls through the borderland countryside. Oswestry Cambrian Railways, Llangollen and Welshpool draw all sorts of rail enthusiasts with their history and special events. What’s on? Let us entertain you. We say Oswestry is ‘Fest Fabulous’ because there are so many different events and the variety is impressive. Don’t miss the free town centre events which are in the streets and our beautiful park. The Hot Air Balloon Carnival, Food and Drink Festival and Christmas Live are the main happenings there. How about music and arts? Looking for a great family day out or want to be taken back in time? Check the Events Calendar or online events page so you don’t miss your favourite. There's so much to see when you visit Oswestry & The Welsh Borders, so don't wait any longer – book your visit now, you’ll be very welcome. 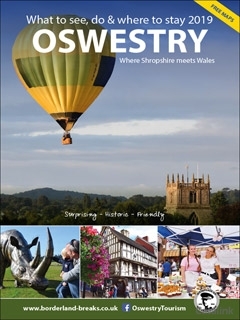 Sign up for the Oswestry – where Shropshire meets Wales brochure to start planning your trip today! By Pressing the Request Newsletter button you give Visit Oswestry & The Welsh Borders (and their Data Processors for the specific purpose of delivering your emails) consent to send you their newsletter via email until such time as you choose to unsubscribe.